A Toe in the Ocean of Books: Adventure #2 in publishing: The printed book! Adventure #2 in publishing: The printed book! This article is about preparing a print edition of your book — which is a little more work than preparing the ebook edition for a novel that's not illustrated. Although there are significant differences for a printed edition, there are more things in common; so if some of these details look a bit sketchy, hopefully it's because I've covered them in my article about preparing the ebook edition — the two pieces are companion articles. Here's a link to my earlier article about preparing the electronic edition: Adventure #1 in publishing: Creating the ebook! New ISBN, PDFs for print edition, adjusted layout, CIP (kind of), costing info, return policy, discount, copyright, page numbers, left vs right layout, font size, costing info, proof copy, dates. The reason I go into the detail I do here, is to try to capture most of what I've learned; so it's helpful for me and my imperfect memory, and I hope it will be of use to others. This article is unusually long; so rather than considering it as something to read from start to finish, it may make more sense to treat it as something to refer to if you're looking for an answer to a specific question. I wrote it, and I found it tediously long to read! But I think it'll be handy in five months time when I produce the print version for Volume 3. I'll try to note all the differences between the print and digital editions of a book. My dream is to have a single electronic version of my book(s), and an automated process for generating both an ebook edition and each print edition; but currently I have a separate file for each. I try to be rigorous in ensuring each has the same content. When I make improvements in one edition, I make them in each other addition, at the same time. Assuming you've bought one or more ISBNs, you need to choose a fresh ISBN to associate with this edition of your book. I've discussed ISBNs before when I wrote about "Preparing to Hit the Publish Button", but it's useful I think to go over it again in the context of a print edition, and perhaps with some missing details filled-in, too. Each physically different edition requires its own unique ISBN. But if you make substantive changes (more than just corrections), you should really use a new ISBN to distinguish the new edition. Check your nation's guidelines on their expectations in this area. If you buy a block of ISBNs it makes it easier for book cataloguing databases around the world to decide your books are related (they tend to assume publishers have runs of sequential ISBNs). It also hugely reduces the per-ISBN cost. Since I'm in Australia and the ISBN assignments are managed here by Thorpe-Bowker (https://www.myidentifiers.com.au/) I log in and visit My Profile (https://www.myidentifiers.com.au/myaccount_myprofile). There, under the "My Account" drop-down I choose "Manage ISBNs". Currently I have several ISBNs set aside for Wild Thing. I assigned the first one to the ebook edition, since I published that first. I've reserved other ISBNs for other editions (5"x8" pbk, 4.25"x7" pbk, large print, but I'm even considering a UK English spelling edition, and a dyslexic-friendly ebook, and even a hard-cover). 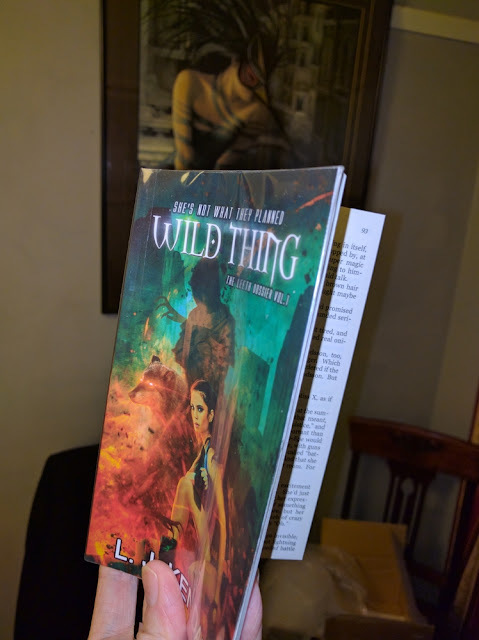 Choosing to publish all those variants would probably be excessive, so perhaps reserving five ISBNs for Wild Thing is more than reasonable for now! I've been keeping track of what ISBN I assigned to each edition in an email to myself. I'm unsure whether it'd be more sensible to use a spreadsheet. Of course, Thorpe-Bowker keep track of what I've assigned; but they don't know what I'm planning, so I think it's sensible to keep track of it myself, too. If you mention a web site in your text (such as a link to your author web site), then in the print edition, remember to spell out the actual URL; though if it starts with "http://" you can safely omit that. If you used colour text for hyperlinks in your ebook, change the text style to use black text in the print edition (unless you've opted for some colour for the insides, rather than B&W). The vast majority of books print the text of the spine running "down": that is, you tilt your head to the right to read the words left to right (in roman script, at least). Have a skim of some bookshelves if you need to check this. Also, if you are writing a series of books, give some thought to where the volume number should appear (readers really appreciate being easily able to sequentially order the books, so do include a number), and the title and author. These should line up nicely when shelved, so your books are pleasing to look at. In other words, legibility and ease of reading. Unlike the ebook, your decision here may as well be carved in granite, since your readers certainly can't increase the font size if they have trouble. It's not hard to pick a typeface that suits the style of the book and is easily readable, but do put careful thought into the choice for the print edition in particular. I've heard people claim that a sans-serif font (like Helvetica or Arial) is just as readable for long blocks of text as the serif fonts normally used for this (Time Roman, Garamond, etc. ), and that there is no scientific evidence one way or the other. I beg to differ. That flies in the face of reason (since the tiny details provided by the serifs are not there for decoration, they're subtle clues carefully created by expert type designers to help our marvellous pattern-recognising brains identify letters in an instant); it's also contrary to my personal experience; and more tellingly, Carnegie Mellon University researched this topic more than thirty years ago and published several papers. Their conclusion? Serif text was preferable to sans-serif for long pieces of text. I know this because my wife, a PhD in English and a professional technical writer of excellent skill, paid for copies of the research when the question came up, early in her career. Your choice of typeface will affect how much space your text requires, and thus how many pages and therefore also the cost. And if you want a special font that's not provided as part of your computer system, beware that if you want to license the rights to use it for publishing books, the cost is likely to be exorbitant. I investigated the use of Garamond, but gave up when I realised it would cost me several hundred (or was that a thousand?) dollars each year. The reason I preferred Garamond over Times Roman was that, as well as simply being a beautiful and readable typeface, remarkably, it was as tightly set or tighter. I think its readability is due to its greater "x height" (the size given to the lower case letters, basically), which makes the font appear bigger overall. But I think Gentium and Georgia are very pleasant alternatives. Google and others have also produced a large range of good typefaces for free. Whatever you choose, do check the licence to make sure you're allowed to use it for your book. Similar to the typeface and size you choose, give careful thought to the line spacing. If you pack the lines too densely, the text will be either awful to read, or — if you get it only slightly too tight — subtly draining to read. Neither of which you want for your readers. I made the initial mistake of using no indentation for the first line of my paragraphs, opting instead for an increased gap. Traditionally published books don't do that: they maintain a consistent and pleasant line spacing, and indent the 1st line of each paragraph. They do this because it's just as easy to see that a new paragraph has started, but greatly reduces the number of pages required for the same text. That translates to saving more trees and lowering costs which you can pass on to your readers. Unlike the eBook edition, you'll need page numbers, naturally. (Amazon will automatically strip page numbers if you have them in your .mobi file, I found, so I think it makes sense to leave them in by default). But where to place them? You can save considerable space, and reduce the page count, by including the page number in the header rather than reserving space in the footer of each page. If you do this, it's normal to place the number on the outer margin (i.e. leftmost, on left hand pages, and rightmost on right hand pages). In the header, it's normal to alternate left and right pages with the author's name, and the book title. Sometimes in a smaller font, so it's not distracting. Leave enough space between it and the body of the page so it doesn't look like the page's text starts with the header! Of course, you need a different page layout for left and right pages, since you need the margins to be mirror images of one another, because (generally speaking) you need more space on the edge of the page that joins the spine, simply because the pages curve in tightly together. There's nothing more irritating than not being able to read the text without splitting the book in two, or having to peer into the gutter to try to see the letters! And as well, you need to alternate Title vs Author on left and right, as well as placement of the page number if you've included it there, too. It's worth a flip through to check that all your left hand pages use the left-hand header and footer, and likewise for the right hand pages. Oh! And remember that page one must be a right-hand page, or you'll look like you don't know what you're doing. If you used some colour text for some reason in your digital edition (e.g. to make chapter titles stand out), then assuming you're opting for B&W interior the print edition, remember to change them to black. Your printer may offer you choices of cream or white for the internal pages, and matte or glossy finish to the paper. Choose whatever you prefer, and can afford. My own taste runs to the cream colour non-glossy paper, simply because that's what looks normal to me from most paperback and hardbacks I've read (textbooks aside). Perfect binding is not as durable as saddle-stitching, but it's far less expensive. While early generation print on demand systems had problems in durability, I think those days are long past now. The quality of print on demand books (at least, from my personal experience with Ingram Spark; as well as the claims of other printers) matches that of offset printing in massive runs. The price of each POD book is dropping slowly, too, approaching that of offset printing, but without the huge financial risk of printing thousands of books. Incidentally, that massive up-front investment is, I think, the core reason for many, many aspects of the business model followed by the traditional publishing industry. I think it's unusual to include a table of contents in a printed book if it's fiction (the reverse is true for non fiction), but if you've given chapters interesting or descriptive names, it's not that unusual to include a ToC. And if your book is broken up into "Parts" or "Books" an abbreviated ToC listing just those is not that unusual. For the printed book, most publishers/printers want two PDF files: one for the cover design, and one for the rest of the book (the insides, if you will). PDF is a well-designed and well-understood standard, though it is complex. You need to check out what your publisher/printer wants, and follow that exactly. It's very likely they'll have a template for you to follow. They'll need to know the page count, too: the more pages, the wider the spine (and the greater the printing cost, of course). Chances are, they'll have a web page where you enter the page count, and it'll tell you how wide the spine will be. I'll talk about the cover in a minute, but let's address a few obvious details for the PDF used for the contents: i.e. all those pages filled with the words you've slaved over. A subtlety I hadn't observed initially was that the first page of every chapter normally omits the page number; likewise for any pages that stand between "parts" or major sections of a book. And doing this in LO is slightly tricky, since you can't change a page's style after you've introduced a page break. You need to have defined at least one page style that omits footers and/or headers (as appropriate for your placement of the page #); then you have to delete the page break, then re-insert a "Manual break..." (not Page break), this time choosing "Page Break" together with the page style you've defined for this new page. For the contents, when using LibreOffice, this is as simple as choosing the Export to PDF option. I think it's sensible to choose 100% for the JPEG compression quality, and to only select the "Archive PDF/A-1a (ISO 19005-1)" for the PDF format, and "Export automatically inserted blank pages", for the General options: tagged PDF and bookmarks and comments are irrelevant for a printed edition. The blank pages are to ensure that the correct pages appear on the correct sheets. I think selecting that will ensure that each odd page appears on the right-hand side page, and each even page on the left — provided you're using a sensible template that has margins set correctly for the odd and even pages. The problem was that IngramSpark's quality-check reported the PDF files had two errors that needed correction. One was the inclusion of transparent objects (I think LibreOffice generates some spurious invisible transparent object) and also an image with low resolution (I think that was the QR code, which is just a blocky PNG image, that does not need to be high resolution). The report said that they could fix these, so I ticked the box that requested them to go ahead and do so. I checked the eproofs that IngramSpark delivered to me, carefully. One awful error (mine) was a missing blank page at the very start, meaning page 1 was on the left! I fixed that quick-smart. For the PDF for the inside contents, assuming it's all black and white, I think any kind of PDF file (in which the text is encoded as text — not as images!) should be fine. The PDF produced directly from LibreOffice is very good. The story is very different, however, when CMYK colour is included in the picture. For the cover, since that's going to be in colour, you need to know whether the printing/publishing company wants the artwork in the CMYK colour space used by their press (Cyan Magenta Yellow and blacK), or in RGB (Red Green Blue) as you'd want for the ebook cover. A very brief note about CMYK vs RGB: CMYK represent "subtractive colours" produced by ink or paint absorbing light; e.g. yellow ink absorbs all visible frequencies except yellow, so that's the colour you see. Whereas RGB colours are "additive colours", used by TVs and monitors, produced by tiny glowing red, green or blue dots on the screen, emitting light. E.g. on screen, red and green together produce yellow. And two important consequences are that 1) although both colour models produce mostly the same colours, each one also has a large number of colour that cannot be represented by the other colour model; and 2) if you put too much ink onto paper (e.g. if you had 100% cyan, 100% magenta, 100% yellow, and 100% black: a total of 400%), you end up with a "coverage" that probably exceeds what the paper will soak up, and bad things can happen: ranging from warping of the paper, colours running, or the page becoming brittle and prone to cracking. Your printer will advise you of the limits they require: e.g. the "US coated (SWOP) v2" is a common "ICC colour profile" that limits ink coverage to 240%. Because the spine is part of the cover, and its width depends on the number of pages and on the paper stock you choose, your printing company should provide you with a template file that shows exactly where they expect the front cover, spine, and back cover to be, and their dimensions. (And inside flaps, if you're producing a wrap-around cover for a hardback.) Alternatively, they might simply tell you those dimensions: if so, you need to create the artwork to follow that exactly. As well, you'll need a barcode that represents your ISBN (often, the printing/publishing company will include that in the template they provide you). The template file they provide you will typically be a PDF (an international standard), or in InDesign (a proprietary Adobe format), or something else. In practice, if your printer/publisher requires CMYK colours specified, this means you must generate either a file of type PDF/X (which is also called PDF/X-1a), or PDF/X-3. I believe PDF/X requires every graphic object encoded in the file to use a CMYK colour space, whereas PDF/X-3 allows objects to individually specify an RGB or a CMYK colour space. Be careful about trusting Acrobat's CMYK coverage reports — http://creativepro.com/why-you-cant-trust-acrobats-separation-preview/. Which is all well and good, but I think that may ignore some practical considerations: if your printer tells you they need PDF/X files, then they almost certainly do, and that's what you should give them. Check with your printer/publisher: IngramSpark required a CMYK PDF file for the cover. The problem I found when I received my proof copy of the book after I used Inkscape with CMYK images to naively try to produce a "PDF with CMYK colours", was that the colours were oversaturated and also appeared to have a greenish tinge washed through it. I think this was a consequence of working with CMYK-encoded JPEG images, but saving out to a PDF file that was marked as having sRGB colour space. (Inkscape does not currently support export of CMYK PDF files.) I also had my name much too close to the edge of the cover. I needed to fix both these issues. In the meantime, though, I'd developed a most unusual problem with my Linux system, and to straighten it out I reinstalled it with a bleeding-edge version. Unfortunately, I then found that Inkscape had a bug in the conversion of CMYK JPEG images on 64-bit systems, and inverted the colours! This forced me to use the RGB images which Mirella had provided me for the ebook edition, then cross my fingers and hope for the best! It seemed to work okay for the 5"x8" edition that I released in Jan/Feb 2016, though I think even then IngramSpark warned me there might be problems. In October, when I was preparing my 4.25"x7" (A-format) paperback edition of Wild Thing, I received a fresh report from IngramSpark that the cover was problematical: most of it exceeded the recommended 240% coverage, although it was within the 300% absolute limit for their printing presses. They advised me that they could print it, but the picture might crack due to the density of ink. The reason this happened was that I'm using Linux as my desktop operating system (so: most software is free, bugs tend to be fixed if you report them, and you don't have to worry about viruses) but a few popular programs are not available for it. At the time, I'd been using Inkscape to prepare (crop, resize) my covers, using the artwork provided to me by my cover designer (hi, Mirella!). In October, with more time up my sleeve, I investigated properly. With the help of someone at IngramSpark, who very patiently answered my technical questions, I was able to work out the cause of the problem (short answer: not producing a PDF/X file), and went searching again. This time I found one free software package that does very good desktop publishing including generation of PDF/X-1a or PDF/X-3 files. It's also available for MacOS and Windows. It's called Scribus https://www.scribus.net/, has a good and comprehensive manual, and very importantly, their web site provides information on where to download "ICC colour profiles". And since IngramSpark had helpfully shown me they used "US coated (SWOP) v2", the Scribus web site made it easy to find and install that file on my system. I won't go into the details of how to use Scribus. The key thing to know is that you draw by inserting an image frame to hold an image, or a text frame to hold text, and so on, and then import files to fill those frames with content. (Scribus also has quite a good, simple, and feature-rich text editor, although it's a little bit clunky to use.) And the 2nd key thing to note is that you need to install some ICC colour profiles before you start it up, so the option to enable Colour Management is available. You can then configure the PDF export to use one of the CMYK colour profiles you've provided. From that point, Scribus will handle the conversion of your images into the colour space you've nominated when you export to PDF. This is true even if you've turned on the option to show you when you've used colours that are "out of gamut" or too dense: converted to fit within the colour space you've chosen. Scribus worked really, really well. It even imported the .psd (Photoshop) artwork files with the CMYK images that Mirella had provided me. I carefully read the Scribus manual first, though, and it did take me two days to learn to use it well enough to produce the new version of the cover, some new business cards, and some pamphlets. Scribus has been pretty stable and complete as of 2012. Give it a try! Because the physical pages are trimmed after they're physically bound together to get those nice crisp edges we all love, the printer will need you to design something that includes a margin of error, since some physical movement is inevitable. These are called the trim edges, and the amount you go past the trim boundary is the bleed amount: basically, you want to put some pleasing but non-critical artwork in these areas which you won't mind losing if the cover is not cut exactly along the notionally correct edge. Don't put horizontal lines near your horizontal page edges, nor vertical lines near your vertical edges, in case it's printed very slightly askew: the narrower such a gap is, the more obvious any error in alignment will look to the human eye. The printer may provide you a barcode graphic that represents the ISBN you have assigned to your book: position this where your publisher/printer recommends, and don't re-size it! If they don't give you the barcode image, you can get free software that will convert an ISBN to a barcode graphic. Thorpe-Bowker will also do it for you, for a small fee. It occurred to me it would be a good idea to include a URL in the text that pointed readers to the print edition; and to also add a QR code alongside the barcode on the cover, that simply encoded that URL for easy scanning by a smartphone. For the URL, I used Bookshow.me (as explained in "Preparing to press the "Publish" Button", under Marketing Plan) to "globalise" the URL provided by Amazon, and to generate the QR code I simply used a free Linux tool (<a href="https://launchpad.net/qreator">qreator</a>) and its graphical front-end (<a href="https://launchpad.net/qr-tools">qtqr</a>). (Later, I changed over to using a command line tool, qrencode.) I then just saved the .PNG file and pasted that into the cover design alongside the barcode provided by IngramSpark. A problem with this approach is that it just directed people to the ebook version, not a place to reorder the print edition, but I felt that was the best choice before I knew a URL for people to buy the print editions. I had hoped I to link to them from my Amazon page; in the end, this happened automatically (I think because I spent the modest sum IngramSpark requested, to "advertise" the book). The problem with this approach is that buyers are likely to just go straight to Amazon and if they want the print edition, assume they must buy it from there. Which is fine in the US, since it can be printed there, and it's possibly okay for the UK, too, for the same reason. But in all the other countries in which IngramSpark print, so it can be shipped locally, all you're doing is leading your readers to pay more and wait longer for it to arrive. Incidentally, you can decode a QR image you've created just as easily via the "zbarimg" tool, part of the free "zbar-tools" package on Linux. That's how I can easily tell you what I used for my reader-friendly QR code for finding the books. So you can see I've just encoded a string which does a Google search for ‘"L.J. Kendall"', ‘"Harsh Lessons"', and ‘buy': literally: ‘"L.J. Kendall" "Harsh Lessons" buy'. Initially, I omitted the "buy" search term, but now that my books have gained some reviews, if I omit that qualifier the search mostly returns reviews; with "buy" included the search turns up a mix of places to buy the book, and reviews — and that seems good to me. Ahhh, the joy of receiving your baby in physical form! Yes, order a proof copy. Then give it yet another proof read. I find that each time I read my book in a new mode, I see different errors. (I check it first on my desktop's screen; then as a PDF loaded onto a tablet; then printed on paper as A5 booklets stapled in groups of 16 sheets; then the real book). You could probably avoid all that by paying for a professional proofread/copy-edit! Anyway, I found several more small continuity errors, several typos, and decided to change to US-style punctuation for dialogue (the punctuation goes inside the quotation, instead of treating the quotation as a thing-in-itself), and about 150 sentence-level tweaks to slightly improve wording or clarity. It's funny what you see when you're holding a physical, printed book. I also noticed that some chapter titles had abnormally-little spacing below: I tracked this down to reducing the line spacing for the entries in the Table of Contents (which were still marked as Level 1 Headings), and this somehow carried over to a few of the chapter titles I had edited here and there through the book. I'm also so glad I opted for the cream coloured paper rather than white. And I was enormously happy with the Georgia font, which is wonderfully easy to read, with much larger x-heights than Times Roman at the same nominal point size. At some date your book will be ready to go on sale. Allow enough time for your book's publication information to filter out into the sales channels. Book sellers keep databases of books available, indexed by ISBN and other details. I don't know the details about how the meta-data for your book is disseminated so it lands in these databases, but what I did was provide all the required information to the ISBN provider (in my case, in Australia, this was Thorpe-Bowker), and similar kind of information for the Cataloguing-In-Print people in the government. In addition, the printer/distributor IngramSpark offer an option to "advertise" your book: my guess is that they push the information out to all their partners, too. I think I set a date three weeks after I felt the book would be ready. I really have little idea what the ideal period of time would be! In my earlier article, I thought the national body for managing and recording copyright in Australia was the <a href="https://members.copyright.com.au/">COPYRIGHT AGENCY</a>. Their website states "We're a not-for-profit that provides simple licensing solutions to allow you to use copyright-protected words and images. Fees from licences are paid to our creator members." And adds "Our core function is to license users of copyright material to make reproductions and communications of copyright works under appropriate provisions of the Copyright Act 1968, and to distribute money collected fairly and equitably to copyright owners and creators." There's also the Australian Copyright Council, http://www.copyright.org.au/, which seems similar; but they seem to be independent. I think they're more related to allowing some fair use reproduction of copyright material under license, with some compensation paid to members than with lending rights. I think I was getting confused with the government organisation related to lending books in public libraries and institutions. If libraries buy books, they make some payments that are collected and apportioned fairly to the authors of the books. By registering each of your printed books with the government's lending rights organisation (in Australia, this is https://www.arts.gov.au/funding-and-support/lending-rights), you give yourself the chance to be paid, should any libraries opt to buy your books for their shelves. So, provide all the information for your book; and as you publish more books, remember to return to the copyright agency and register the new books. If your book does get included in some libraries, then you might earn some small income through a scheme set up for that purpose. To be eligible, though, you need to apply for and Electronic and/or Publisher Lending Rights: ELR and/or PLR. In Australia, it's a straightforward process which is open to indie and self-publishers, but only for print books (not for ebooks). If you're self-published, you should apply and register for each of your books as both Creator and Publisher. If indie published, then obviously you only apply as the creator (your publisher should apply for the publisher rights). And you should specify the royalty split just as you have agreed with your publisher. Contact them via their web site, and they should provide you a "Claimant No." and corresponding password as a creator (and a separate claimant number and password if you're also a publisher). Then you need to login (at https://lendingrights.arts.gov.au/lendingrights/) and provide all the required details for your printed book(s) as creator (and again, separately as publisher, if you're self-published: logging out as creator then back in as the publisher). Obviously this is an optional step, and perhaps even an overly optimistic one. But, who knows? The US assigns a Library of Congress Catalog Number to each book it holds a copy of. Most other countries use the Cataloguing-In-Print record: see below. For an LCCN, the picture is different: whether a book is accepted into the Library of Congress is up to their librarians. And I believe you can't obtain it after the book is published. Nor does it make much difference to you as an author, I believe. Reports also seem to vary about whether indie publishers are accepted or not. But instead, in the US you might consider obtaining a PCN (Pre-assigned Control Number). Again, I think this is easy and cheap or even free to apply for: beware of companies offering to sell or obtain an LCCN or PCN for you. You probably have a better idea of the categories your book falls into than a librarian who may not have yet read your book. This isn't a number: it's a block of text with human-readable fields that you can request from your National Library Association. It's used by librarians to help find books. I think it's well worthwhile obtaining a CIP: the only cost is that you are obligated to provide a print copy of your book to your national library. When applying for the CIP (or PCN), the national body's website (in Australia: Thorpe-Bowker) will present you with online forms which you simply fill in. As part of that, they'll provide an option to choose the categories and sub-categories that best describe your book. It makes good sense to do this honestly and with careful thought. The hierarchy of categories is quite deep. I suspect doing this may improve the discoverability of your book in the databases accessed by book stores, and through more general online search engines. When you fill in the required information on the Thorpe-Bowker site after logging in, they provide options to set the Primary Subject and Secondary. For The Leeth Dossier, I've as the general themes I selected Fiction — Science Fiction General and Fiction — Fantasy General. It's in these tabs that you fill out details such as whether it's an ebook or a print edition, including format/size. After that, you can drill down to provide a much more detailed categorisation. The hierarchy is long and goes down to about five levels in some areas: I expect it ties into the Dewey Decimal classification system. You can and should use exactly the same categories for the print edition and an ebook edition. It might be wise to make a note of the categories you've identified, when you first do it, to make it easier to pick the same categories for the other edition. But it also pays to have a browse around the category hierarchy to double-check you haven't omitted an important category. I noticed I hadn't updated my Thorpe-Bowker ISBNs with the details for the planned 4"x7" edition. Thorpe-Bowker make it easy to copy the edition details to a new ISBN via their "clone" button: after clicking on that, you simply select the ISBN that you want the details copied into, and then you're presented with a page to make the changes needed to distinguish this edition from the others. Two oddities I noticed here: even though Wild Thing is Volume 1 in the series, and there is an option to provide information about the volume no. when a book is part of a series, if you choose that option, it won't allow you to enter a "1" to say it's the first volume. And if you leave it blank, it complains that you must provide a number greater than 1. So I don't see how you can tell Thorpe-Bowker that a book is volume 1. And if your book has no illustrations (not counting the title), then you can't enter "0" for number of illustrations, you have to leave it blank. Go figure: perhaps they need a usability expert to give their website a slight overhaul. It's very workable and functional, all the same, and that's the main thing. You also need to put some careful thought into the price to charge for your print edition, when it will be released, and so on. A particularly important decision here is the discount you will give book stores, and whether you will allow "returns". But the book should still make its way into the databases, and should turn up as able to be ordered on demand from book stores. To have any chance at all of your book being ordered by book stores, they need to be able to make a profit in doing so. This will be easier if they order more than one copy, since the processing and delivery cost will be spread over several books, instead of concentrated in just one. But if they prefer just to order a single copy when a customer orders your book, they'll need to cover the delivery and their own internal costs. For these reasons, you need to provide a discount for book stores. This ranges from 30% to 55%, typically. The higher the discount, the more attractive your book will be to the stores; but the less you make. I can't advise you on that, other than to say, think about it carefully, look at what similar books cost, and discuss it with friends who understand business and sales. But do protect yourself: don't set the price so low that you lose money by selling your book! Nor can I advise you on pricing or number of copies if you opt for offset printing of a single initial print run. Just be aware that you'll need to store all the books you ordered, and pay for the postage as you sell each one, and spend time addressing and mailing them (or delivering them in bulk to resellers), and dealing with problems if books go missing in transit. Personally, I'm very happy to be using print on demand and leaving it to Ingram Spark to handle all that for me. It gives me more time for writing. And here's a longer article that covers different ground to that article, and to this one too — though there's some overlap — Duke Diercks's 1st person account of self-publishing tips and costs. Check it out, it's well worth a read. I'm not sure I agree with the idea of paying someone else to apply for your (P)CIP, but leaving that one exception aside, there are some real gems in there — like the idea about selling into small book-stores! I think Duke's article is actually more digestible than this whopper of a post. You need to decide a release date, too: don't set all this up the night before the book is first available for printing. Traditional publishers handle this very well, with carefully planned marketing campaigns before the release date, all with the aim of getting as many sales as possible when the book is released. Of course, the down side is that for the vast majority of traditionally published authors, this marketing campaign will be a one week or two week effort that runs once only, ever. In contrast, for an indie author who has chosen print on demand, your book will always be available and it's up to you how you choose to market it as well as how long for. In many ways, it's much easier and cheaper to send ebooks to people for review, but professional reviewers for traditionally published books (such as in major newspapers and magazines), tend to prefer a free printed copy, though of course there's no guarantee they'll write a review at all. Their time, after all, is precious. But at least with a print edition you have a chance of that happening, which — if the review is positive! — could lead to a big success for you. Put care and effort into this, though: do your research to find what kind of books different reviewers prefer, and only send your book to someone who might appreciate it. And obviously, any note you send along with your review (a press release) should be as clear and succinct and as useful to the reviewer as possible. But this topic is now leading into the general area of marketing, at which I'm still very much a novice, as well as drifting off topic for this post. Remember to send off a print copy of your book to your national library, if you received a CIP or PCN (or LCCN)! From the contacts list you've created, send out the information to each group. Then follow through on your marketing plan. Prepare the cover and content PDF files for your book as carefully as you can, to make the book as readable and beautiful as you can; make sure you buy and assign an ISBN to it; register the book with the appropriate bodies; check your work carefully after you've done each piece of it; and carefully categorise your book and make it easy for potential readers to find it. And then, give yourself a well-earned pat on the back, relax for a little while. When the creative energies return, dive back in to the writing. With any luck, your readers will be demanding it, and writing good new books is the best way to develop a body of work that may also earn you an income. Nope, that didn't seem to work. How about if I include the "https://" as you should for a URL...? Nope. Odd. Maybe you also need to select "I'm not a robot", even though it lets you push the button without doing that, nor does it give any warning that you have to, if it rejects it after you push the button? Ah, and trying on my mobile phone, with 3rd party cookies enabled, I see that's a total fail: The Add Comment button briefly flashes, and nothing at all happens. And clicking the Reply button to a comment behaves the same, and is completely ineffective. Sad. Sorry I didn't notice your comment before. I'm using blogger, not wordpress, and basically just relying on Google's inbuilt protections. They seem to work well. But also, I always draft each post separately, in a big file I keep, so at the worst I'd lose some polishing.